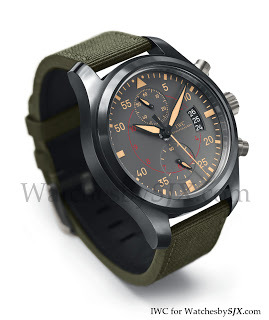 As an SIHH 2012 preview, IWC has just unveiled the new Pilot’s Watch Chronograph Top Gun Miramar, named after the former location of the US Navy Fighter Weapons School (aka TOPGUN). The 46 mm case is dark grey ceramic – in the photos it seems to have a glossy finish – with a dial that has faux patina and a green nylon strap. Inside is the IWC cal. 89365 flyback movement, similar to that in the Portuguese Yacht Club. 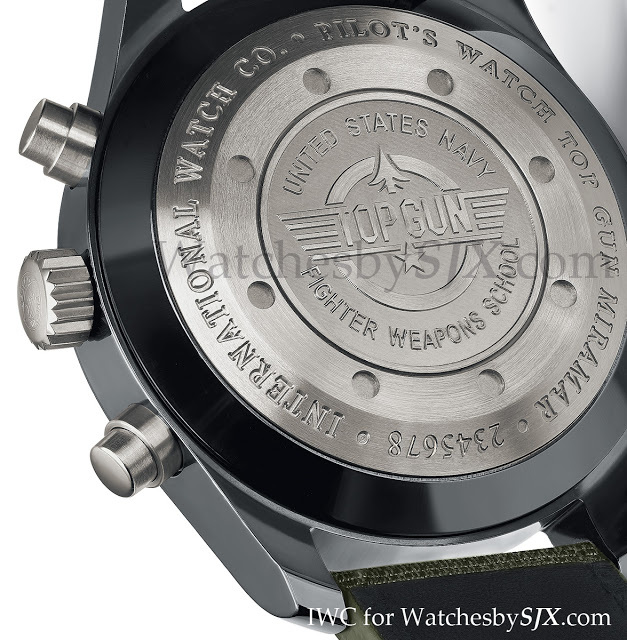 Alongside the chronograph, the Top Gun Miramar range will also have a 48 mm Big Pilot with a similar design. (To clear up some confusion the Miramar chronograph is 46 mm and the Mirarmar Big Pilot is 48 mm.) Based on the stock photo, I am not a fan of the new Top Gun Miramar. It looks derivative, and this vintage military look is starting to get old (no pun intended). At the same time the Miramar chronograph reminds me of the Panerai PAM300 Mare Nostrum re-edition. That being said, I can see this selling well as a mass luxury product. Since 2012 is the year of the Pilot’s Watch, just as the Portofino was the focus of 2011, IWC has also outlined the changes to the rest of the Pilot’s Watch collection. 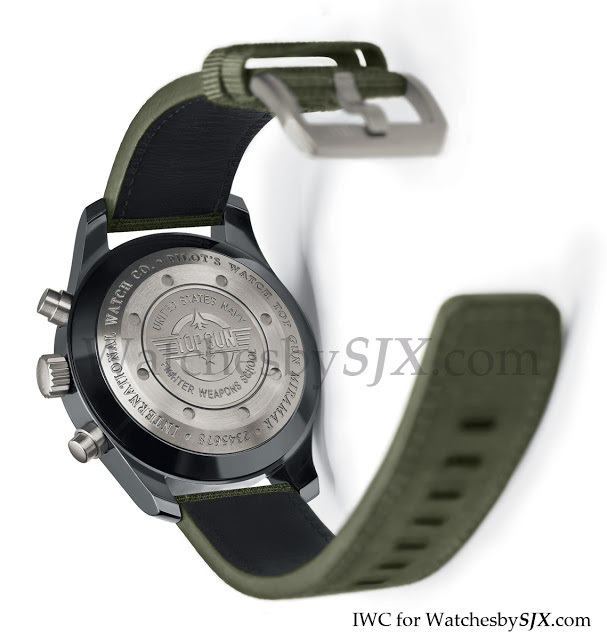 Six new models will be launched, while the others are improved (or not), but no other images have been released.﻿﻿﻿ The rest of the Pilot’s Watches have been revamped as well. The classic Top Gun range now has a Big Pilot’s Watch Perpetual Calendar as well as a Big Pilot. On the other hand, the Spitfire sees the addition of the new Spitfire Perpetual Calendar Digital Date-Month in red gold. It uses the perpetual calendar movement with oversized digital display, first used in the Da Vinci. 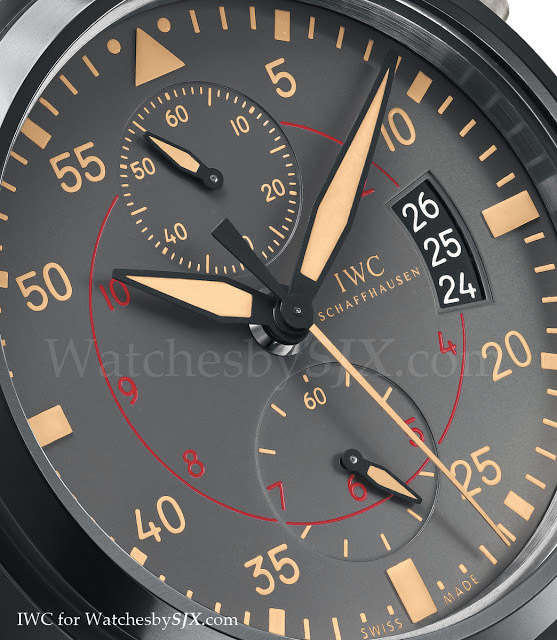 And the Spitfire chronograph now uses the IWC cal. 89365 instead of the 7750.